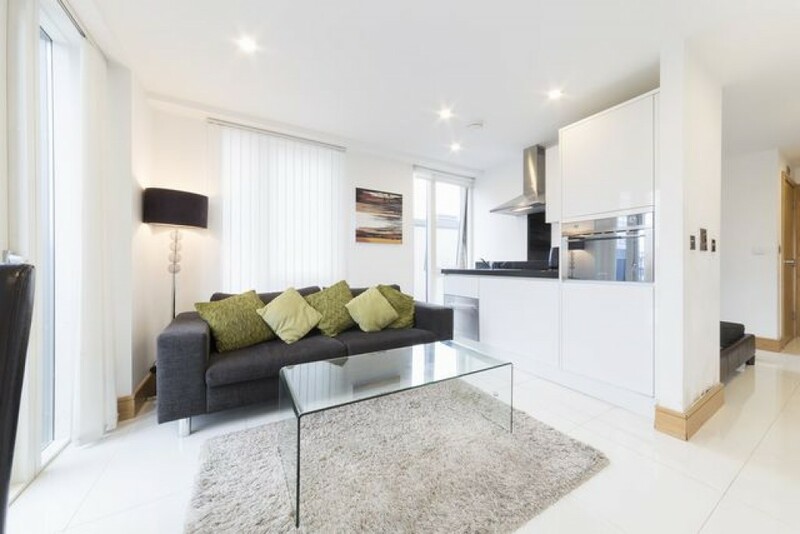 This terrific Euston studio flat rental is high on the seventh floor of the Churchway building, just three blocks from the Euston Tube Station. Euston Tube Station runs the Victoria and Northern lines. Another block and a half further will take you to the Euston National Rail Station and the Overground. It’s just a two block walk to Mark & Spencer’s for marketing which is also highly convenient. The entryway will put you in the hallway where entry to the bathroom and the bedroom are located. As you walk further in your eye is taken to the back of the open floor plan where you enter your balcony. Decorated in complimentary white, everything feels fresh and light. The double sliding door bathes the room in natural daylight. There are a small table and chairs located near the kitchenette. The kitchenette is a full function kitchen with built in stove and stainless dishwasher. There is an overhead hood fan located above the glass cooktop range. The kitchen also has its very own large window and recessed lighting. 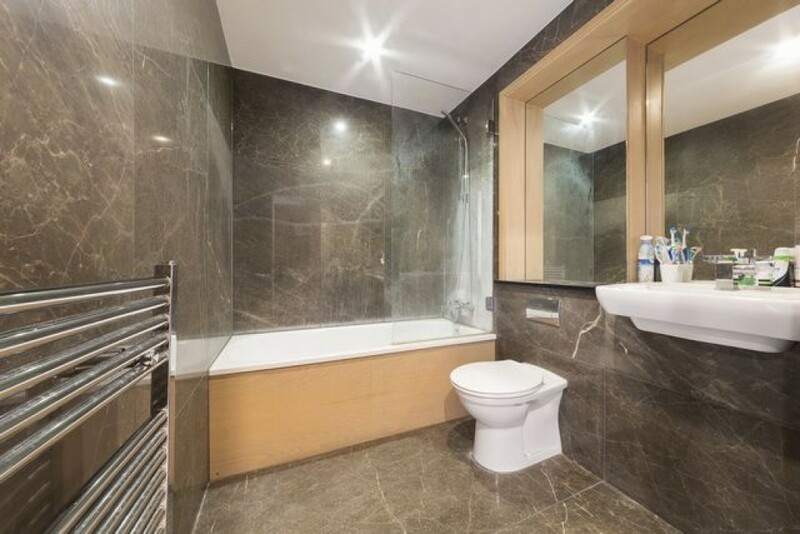 This stunning bathroom has plenty of room and is very contemporary with the marble tile walls surrounding the entire space. There is a mounted sink and double mirror with sliding doors that hide all the storage you’ll need. There is a large tub with a glass surround that goes to the ceiling effectively giving you a steam each time it’s in use. 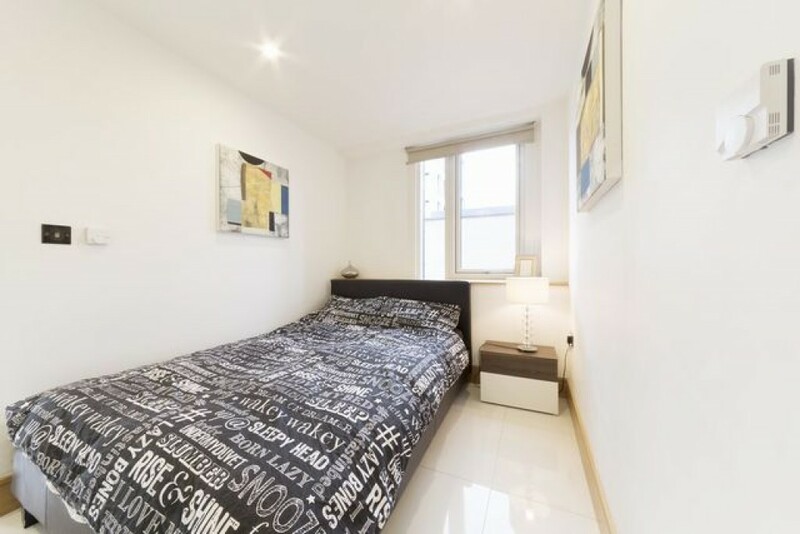 The bedroom in this Euston studio flat rental is good sized and has a queen size bed. Also built in is the floor to ceiling double wardrobe featuring frosted glass. There is also a five-drawer dresser for more clothes storage. The bedroom also enjoys recessed lighting. 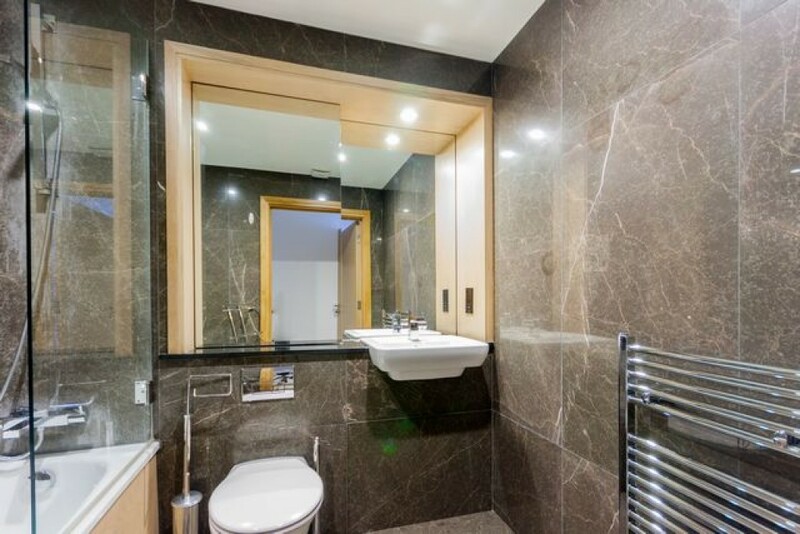 Perhaps the best thing about this Euston studio flat rental is its location in regards to great places to eat, drink and seek entertainment. The busy Euston Road has all the offerings that one could want. There’s the extremely long wine list of the All Bar One at Euston Station and Nando’s Euston location. There is also the restaurant at Hotel Ibis and Bree Louise Pub known for their cider’s and pie offerings. 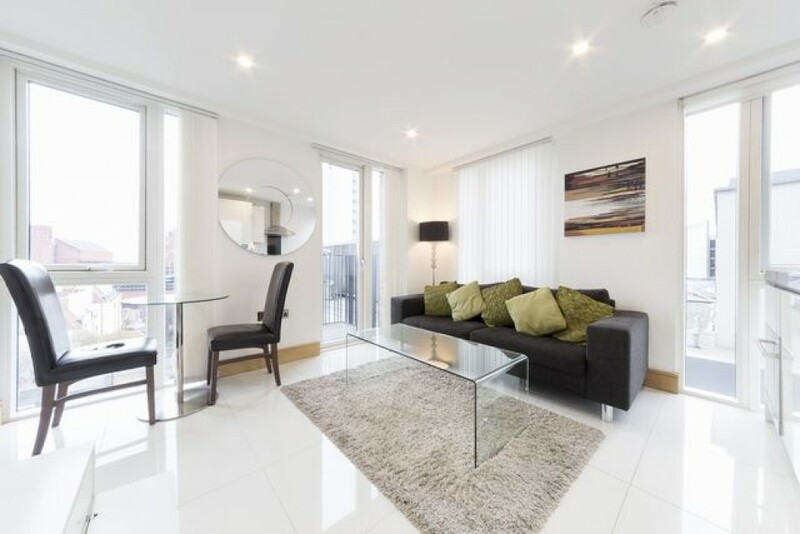 There is a short walk to Euston Square Gardens for your outdoor pleasures and a second tube station Euston Square where you can catch the Metropolitan, Circle, and Hammersmith & City lines. Camden Bars is a great place for live music and the Grand Union Camden for another after hours bar. But be sure not to miss the railway themed pub Doric Arch on Eversholt Street in Euston Square.